Are you or someone you know getting married? Then pick up these stylish sunglasses. It comes 2 to a set. One for him and one for her. The bride's sunglasses come in white and shows bride on the lens with red lips. The groom's sunglasses come in black and has groom in black with a black bow tie. 100% MONEY BACK GUARANTEED QUALITY! Click "Add to Cart" now and order yours today! ✔️ARE YOU OR SOMEONE YOU KNOW GETTING MARRIED? - Then pick up these stylish sunglasses. It comes 2 to a set. One for him and one for her. ✔️The bride's sunglasses come in white and shows bride on the lens with red lips. The groom's sunglasses come in black and has groom in black with a black bow tie. ✔️OUR QUALITY - Our glasses have a high quality polycarbonate frame with 2" plastic lens. The lens have holes in them so you have no issues seeing in them yet they allow others to see the graphics on the lens. ✔️PERFECT GIFT! 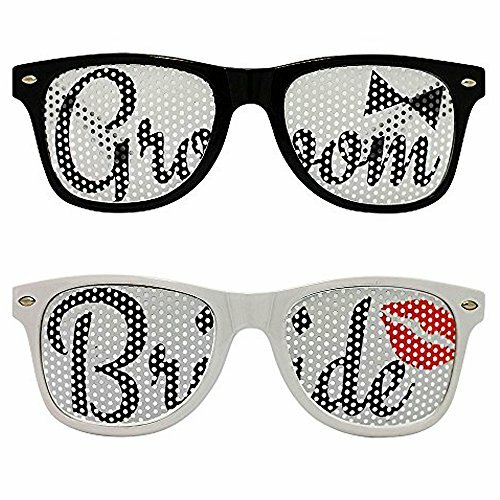 - Wheather you want to have some great photo props or just show off that bride and groom, these glasses are a hit! ✔️GREAT FIT - We understand how annoying it can be to have glasses that don't fit correctly! We designed these so that they are the correct size for an adult and they fit comfortably on your head. If you have any questions about this product by Chades, contact us by completing and submitting the form below. If you are looking for a specif part number, please include it with your message.